This week, Congress is considering a proposal for a bill that would charge new enlistees $100 a month for two years for their GI Bill benefit. New E1s make just under $20,000 a year, and a $100 a month fee would be more than 5% of their total salary. Well over 1.5 million new veterans and their family members have gone to school using the Post-9/11 GI Bill, which IAVA led the fight to pass in 2008 along with the VFW. We realized the vision that IAVA and partner organizations had for our newest veterans when we started to advocate for this historic benefit in 2007. IAVA is proud of our leadership in driving the enactment of this benefit and in championing upgrades in 2010 and 2014 which simplified and improved tuition benefits, expanded eligibility to the National Guard, included vocational programs, and made nationwide in-state tuition rates a possibility for new veterans beginning this year. Despite the enormous success of the Post-9/11 GI Bill, the generation of veterans that have fought – and are still fighting – our nation’s recent wars were shocked when unprecedented cuts were proposed by both parties in Congress to pay for other programs in 2016. 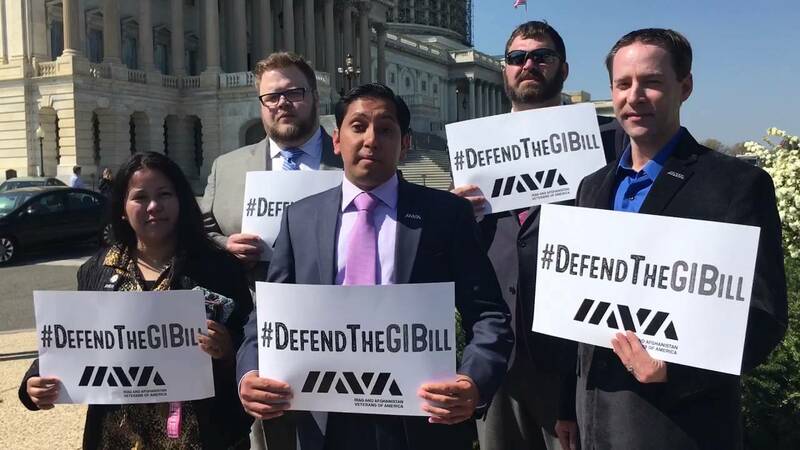 IAVA and its members held nearly 300 Congressional meetings, sent more than 33,000 letters to Capitol Hill, and were a constant presence in the media in our successful campaign to #DefendTheGIBill. Largely as a result of these efforts, the 114th Congress failed to cut this landmark benefit. According to IAVA’s most recent member survey, half of respondents have used the Post-9/11 GI Bill and another nearly 25% are planning to. The enormous cuts proposed for the Post-9/11 GI Bill in 2016 sent shock waves through the veteran community. Nearly 90 percent of IAVA survey respondents oppose cutting the benefit. In fact, three out of four respondents agreed that the post-9/11 GI Bill is important for military recruitment, and nearly 90% feel it’s important for reintegration post-military service. IAVA vigorously and publicly opposes this bill. That’s why we invite you to sign our petition, to tell Congress: taxing promised benefits equates to a breach in trust with the American military. Taxing this benefit is also a threat to military recruitment and retention at a time when the U.S. is still at war with an all-volunteer force. TAKE ACTION: Click here to sign on to tell Congress that a tax on the GI Bill is WRONG. 4/25 – Representatives Tim Walz (D-MN), Brian Fitzpatrick (R-PA), Seth Moulton (D-MA), Brendan Boyle (D-PA), and Minority Leader Nancy Pelosi (D-CA) have all joined IAVA in opposition to the proposal.